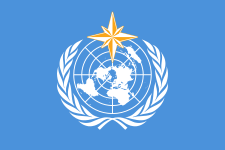 A white UN emblem (world map surrounded by two olive branches) on a blue background. The first version of the UN flag, April 1945. The flag of the United Nations was adopted on December 7, 1946, and consists of the official emblem of the United Nations in white on a blue background. A map of the world representing an azimuthal equidistant projection centred on the North Pole, inscribed in a wreath consisting of crossed conventionalized branches of the olive tree, . . . The projection of the map extends to 60 degrees south latitude, and includes five concentric circles. The olive branches are a symbol for peace, and the world map represents all the people and the countries of the world. White and blue are the official colours of the United Nations. The organizers of the 1945 United Nations Conference on International Organization in San Francisco, California wanted an insignia that could be made into a pin to identify delegates. 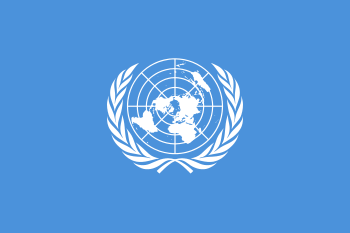 United States Secretary of State Edward Stettinius, Jr. was chairperson of the U.S. delegation, and realized that a temporary design might become the permanent symbol of the United Nations. He formed a committee headed by Oliver Lundquist that developed a design consisting of a world map surrounded by leaves from a design created by Donal McLaughlin. The blue that appears in the background of the insignia was chosen to be "the opposite of red, the war colour", although the exact shade has never been officially specified by the United Nations. The original colour the group chose in 1945 was a gray blue that differs from the current United Nations flag. The globe used in the original design was an azimuthal projection focused on the North Pole with the United States, the host nation of the conference, at the centre. The projection that was used cut off portions of the Southern Hemisphere at the latitude of Argentina, which was acceptable at the time, as Argentina was not planned to be an original member of the United Nations. The projection was later altered so that no country will be at prominence within the flag. The new logo was now designed so that the globe is bisected in the centre by the Prime Meridian and the International Date Line. In 1946, a UNO committee got the task of making a definite design, which was presented December 2, 1946, and adopted by the plenary session of the UNO on December 7, 1946. The earlier version had the globe 90 degrees turned eastward compared with the present flag, which has the Prime Meridian and the International Date Line forming the vertical diameter. According to press statements, the change was made to move North America away from the centre of the emblem. According to the Convention on the Safety of United Nations and Associated Personnel, the emblem and the flag of the United Nations can be used by the personnel and material of UN peacekeeping missions as a protective sign to prevent attacks during an armed conflict. The United Nations flag may also be flown as a garrison flag with other country flags. Garrison size is 10 feet by 30 feet. The flag of the World Food Programme has the olive leaves of the UN flag, with a hand clutching grains in the centre, in place of the globe. The white/blue colours of the UN flag are reversed in the WFP flag. IAEA International Atomic Energy Agency The IAEA has a flag with the same colours and olive leaves as the United Nations. The central symbol is a Rutherford model atom. The IAEA is independent of but reporting to the United Nations. ICAO International Civil Aviation Organization Is that of the UN with pilot's wings superimposed. ILO International Labour Organization Is that of the UN, but replacing the map with an interrupted gear wheel with the letters "ILO" inside it. 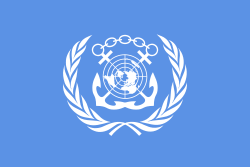 IMO International Maritime Organization Takes the UN flag, shrinks the map image and puts a chained cross of anchors behind it. ITU International Telecommunication Union Has the ITU logo—a globe, lightning bolt, and the letters "ITU". UNESCO United Nations Educational, Scientific and Cultural Organization Has the same colours as the United Nations; its symbol is a Greek temple (possibly the Parthenon), representing science, learning and culture. The six columns are made of the letters of the organization's name. UNICEF United Nations Children's Fund Has the leaves and globe of the UN flag but with a mother and child inlay instead of the world map. UPU Universal Postal Union Is UN blue with the organization's logo in white. WHO World Health Organization Identical to the UN flag, with a Rod of Asclepius, a traditional symbol of medicine, added. WMO World Meteorological Organization The flag is that of the UN with a compass rose and the letters "OMM/WMO" atop the globe. 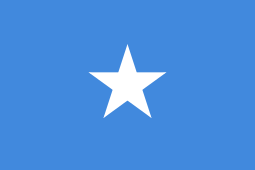 The flag of Somalia, with central symbol a five-pointed star, uses the UN's blue colour in honour of the UN's help in gaining Somalia's independence. 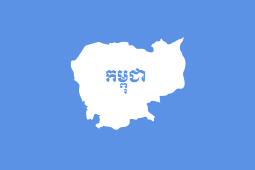 The UNTAC UN administration of Cambodia used UN colours. Perhaps the most popular proposed flag of Antarctica (the Graham Bartram design) uses the UN colours, consisting of a plain white representation of the continent on a blue background. A number of proposed flags of Bosnia and Herzegovina used UN colours. A proposed flag for a United Nations Parliamentary Assembly uses the same colours and olive branches and uses the cartographic elements of the globe to create what appear to be parliamentary benches. The UN flag is depicted in the background of former UN Secretary-General Dag Hammarskjöld on Sweden's 1000 SEK banknote, the currency's highest denomination. The banknotes have been in circulation since October 2015. ↑ or using the same proportions of the national flag of whatever country it is flown in, with the emblem being centred and one half of the hoist. ↑ UN General Assembly A/107, Official Seal and Emblem of the United Nations, 15 October 1946. Accessed March 15, 2010. ↑ Flags Of The World, United Nations Organization, Flag Colour. Accessed March 15, 2010. ↑ Heller, Steven. "Oliver Lincoln Lundquist, Designer, Is Dead at 92 ", The New York Times, January 3, 2009. Accessed January 4, 2009. ↑ Znamierowski, Alfred. The World Encyclopedia of Flags. p. 222. ISBN 0-7548-0167-5. ↑ Talocci, Mauro. Smith, Whitney, ed. Guide to the Flags of the World. p. 131. ISBN 0-688-01141-1. ↑ "New banknotes". Sveriges Riksbank. Retrieved 1 June 2013. 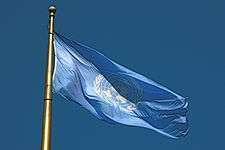 Wikimedia Commons has media related to Flag of the United Nations.